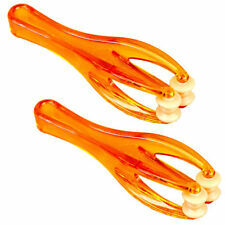 Description:Thisbeauty massage tool is made of natural rose quartz. Pressing lightpressure and rolling on skin with this roller can promote skin bloodcirculation and metabolism. 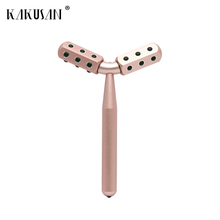 Long time using can assist to eliminate skinwrinkles and spots, delay skin aging.Features:The roller is designed according to facial curve and used for beauty. Fine workmanship, it is ground and polished many times, more smooth to use.Massageface with the big roller head from bottom to top along the growthdirection of skin, witch can improve the skin and avoid muscle sagging.Use small roller head to massage periorbital area, from inside to outside, which can reduce fine lines and prevent wrinkles.The length of the handle is designed more reasonable, more comfortable to hold.Specifications:Material: Rose quartz, metalSize:15*5.5*2cm/5.9*2.1*0.8inWeight: 62g(approx. )Package Includes:1 x RollerNote:1. Please allow small size error due to manual measurement. Thanks for your understanding.2. Monitors are not calibrated same, item color displayed in photos maybe showing slightly different from the real object. Please take thereal one as standard. Sealed Package, Come with a Travel Case. Only for personal use. Do not share with other people. 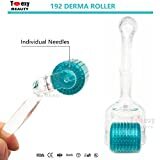 The roller is designed according to facial curve and used for beauty.Fine workmanship, it is ground and polished many times, more smooth to use.Massage face with the big roller head from bottom to top along the growth direction of skin, witch can improve the skin and avoid muscle sagging. New! Panasonic Roller Beauty Machine EH-SP32-S from Japan Import!